I’m not sure how long I stood on the platform of the dive boat, weighted down by the 30+ pounds of scuba gear, but long enough for the crew to offer me multiple encouragements and probably start placing bets with each other on how long it would take me to actually get off the boat and into the water. 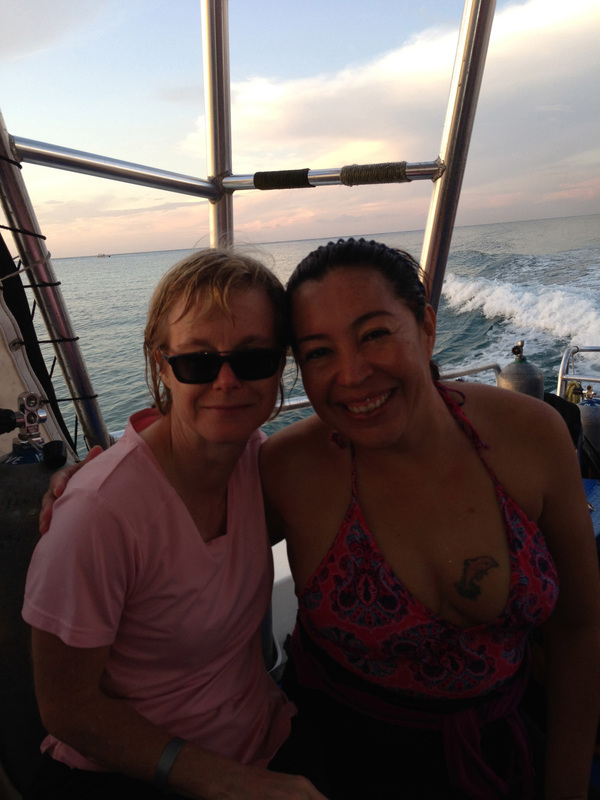 So here I was, standing on a dive boat off the Mexican island of Cozumel, while Carla – my instructor from Dive Palancar – beckoned from below and the crew reassured me that everything would be okay. I had a tight grip on the railing even as I had one foot lifted in the air, ready to step off. Why was I here? Why did the thought of submerging my head under water scare me so? (I don’t know about you, but the sensation of water coming up over my chin freaks me out.) The only bad experience I’d had in the water came during childhood when I was 6 or 7. We were fairly new to the neighborhood when the red-headed girl who lived in the green house at the end of the street invited me over. (I want to say her name was Amy, but Amy may have been the blonde girl who lived on the street behind us instead.) I was thrilled to get an invitation from a popular girl with a swimming pool in her backyard. It was one of the those huge above-ground pools – maybe eight or ten feet deep – surrounded by an even taller fence to keep out trespassers…or keep others in. As they both yelled at me, I began to cry and – finally – started screaming. Fortunately, my older siblings had made friends with the kids a couple doors up the street and were outside playing. They thought the scream sounded familiar and came to investigate. They rescued me. Thanks Laurie and Doug!! I had been taking swimming lessons at the local junior high before that incident. I had been the darling of the class, diving down to grab the rings the teacher threw into the pool. Afterwards, I would cower under the bench and refuse to come out. The teacher gave up on me. I’m not sure how long it was before I stopped going at all. This was not childhood. I could let go. Finally I took the “big step” (like you see in some movies: the diver lifts one foot up and essentially walks off the boat, not the falling off backwards like you see in others.) As promised, my BCD vest – filled with air – brought me back up to the surface to meet Carla, and allow her to guide me down to our target depth of forty feet. Yes, I panicked a bit. I wasn’t equalizing the pressure in my ears correctly and that’s quite painful! 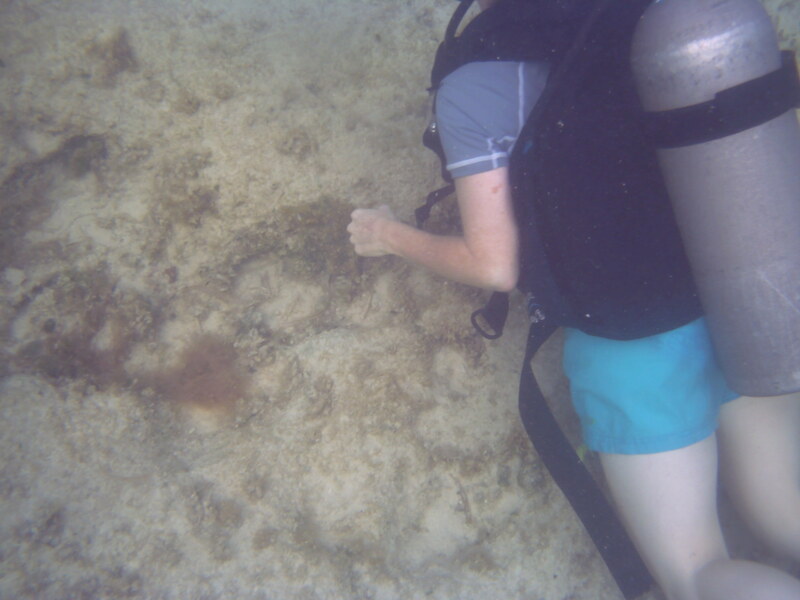 After a brief return to the surface where Carla patiently calmed me down, we descended again. And stayed down. It was an amazing experience. The corals are beautiful and the fish are amazing. We saw a small nurse shark, enough lobsters to feed my family, huge crabs, barracudas, a moray eel, and several sea turtles – including one who was eating coral while we watched. We were fairly close to it, but after a brief glance at us it went back to eating. That was really cool! Am I glad I did it? Yes. Would I do it again? Yes. In fact, I did it again the very next day. And, yes, I did hesitate once again while standing on the dive platform. But it didn’t take me as long to get in the water…because, this time, the boat crew pushed me in.